Although I didn't release a new record in 2015, it was still a busy year. Here's a little recap of what I got up to. I Wanna Destroy is a multimedia collaboration between EMA and virtual reality designer Zach Krausnick. Combining elements of installation, live concert and 3D VR technology, the result is a combination of technological micro-narrative and human durational performance. On February 15th, one of the coldest days of the year in NYC, Zach Krausnick and I performed the first iteration of "I Wanna Destroy" at PS1 MoMA in New York. For me it was a 4-hour durational performance made up of a brand new song cycle and accompanying narrative. I worked with Zach to make a unique 3D Virtual Reality environment which he was able to manipulate in real time and kind of "play" along with the music while audience members donned the Oculus or watched the content projected on the walls of the dome. For more info please click here. I recorded this version of the Sinead O’Connor song “Black Boys On Mopeds” during the winter, before Christmas. I did it late at night during a power outage, straight onto the laptop in a cold house filled with candles. I meant to release it over the holidays but for multiple reasons it just didn’t happen. Now an investigative report by the DOJ has confirmed a history and pattern of racially-based discrimination and harassment amongst the law enforcement of Ferguson, MO. I’ve chosen to leave the “season’s greetings” motif unchanged, even though I consider this issue to be ongoing. In May I chatted with Jessica Hopper about her new book The First Collection Of Criticism By A Living Female Rock Critic in Portland. In June I was extremely honored to be part of the cyberfeminist art and research collective Deep Lab's residency at New Museum as part of the Ideas City festival. Riffing on the idea of surveillance and also my time as a substitute teacher, I did a performance where I asked audience members to draw one another. The drawings were then processed using the Generate App and projected onto the walls while I played a long form piano lullaby. People sat on large cushions, drank beer and drew. The topics of surveillance and technology can be kind of heavy and dense. I wanted to create a kind of carefree and child-like atmosphere. Audience drawings from the Deep Lab performance at the New Museum. My next project was called "Sacred Objects From Suburban Homes". It included a public call for "sacred objects" via NewHive and email and a residency and performance at Barbican Centre in London as part of Station To Station. Select objects were rendered into 3D and placed into another unique virtual reality environment built by Zach Krausnick and I. 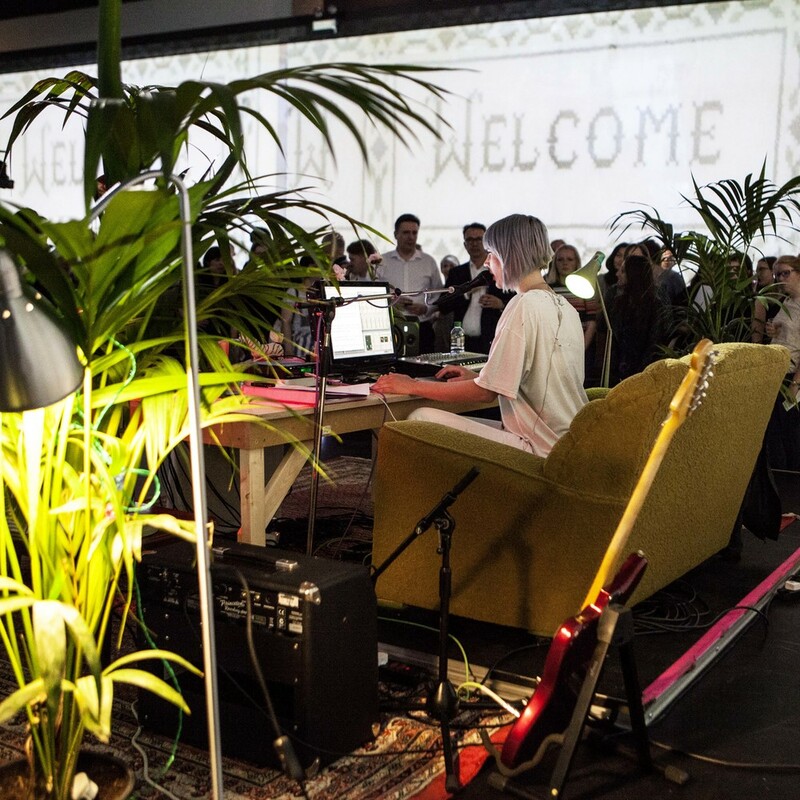 Visitors to our residency at the Barbican could don a headset and experience it firsthand. Many had never experienced Virtual Reality before, and at least one user described it as "quite psychedelic". 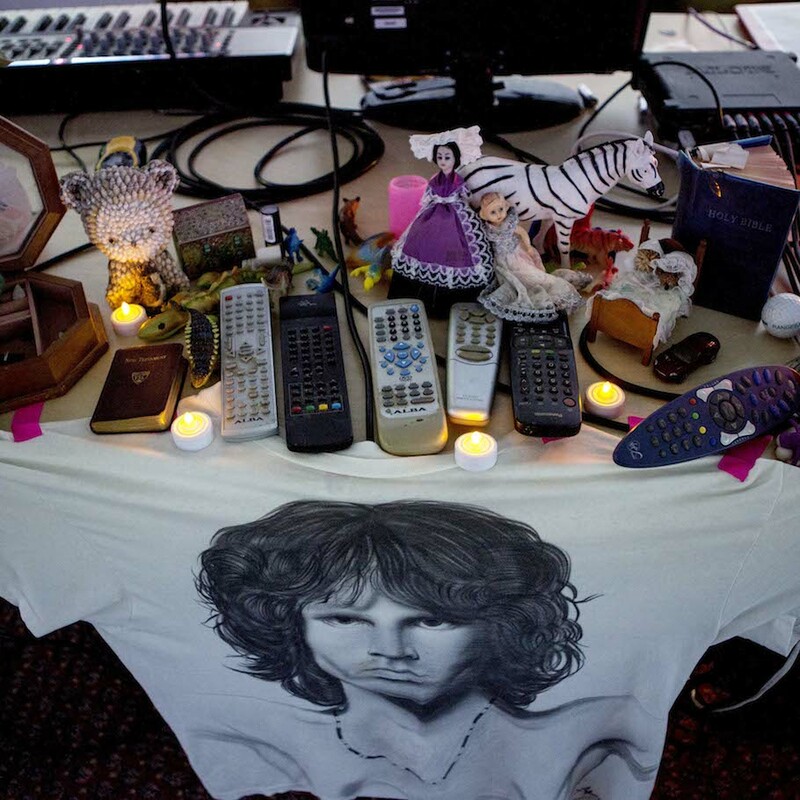 The residency culminated in a performance where I read my own history of sacred objects surrounded by live projections by Krausnick and altars of sacred objects (remote controls, knick-knacks, stuffed animals, etc) all around the room. Audience members could stand or sit. Paper and pencils were provided, and audience members were encouraged to submit drawings and descriptions of their own sacred objects, which were then immediately incorporated into the live visual projections and spoken text. This experience was definitely one of the highlights of my year. Lyrics by EMA. Music by Alexandra Atnif and EMA. On October 1st, 2015, we had what was apparently the 296th mass shooting in the USA. That is more than one per day. I want to give special thanks here to my labels City Slang and Matador for supporting me in releasing this track in a timely matter. situations in case a mass shooting breaks out. Read more about guns and mass shootings in America via The Washington Post. Read about Australia's successful gun control measures via Slate. I got to interview one of my absolute favorite authors (and kinda sorta idol), William Gibson, for PAPER magazine. In November the first film I have ever scored came out. #Horror is directed by Tara Subkoff and includes a great cast and a TON of really cool art. Leif and I worked hard on this and I'm really please with our contribution. The original score is now available to buy or stream. "Amnesia Haze" is the main single from the film. I got to work with my friend Severiano Martinez on both the song and the video. It's poppy but the lyrics are kind of like a eulogy, my version of "Sweet Child O' Mine". It's weird to be an artist sometimes, especially in the downtime between releasing big projects or albums. The work you are doing isn't always apparent, so it's nice for me to look back and see the evidence of all the fun and weird stuff I got up to. I especially enjoyed being able to do some non-traditional performances in places like the Barbican, MoMA PS1 and the New Museum. I'd like to do some more of that.